CardMonkey's Paper Jungle: Happy Birthday to the Krazy Crafting Crew! I have been honored to be one of the original members of the Krazy Crafting Crew (KCC) which came together to virtually craft together and to show our projects in monthly blog hops. Well, about a year ago at this time of year, the group became "official" with its name, thanks to our founder, Lissa Marie. We've been together -- supporting one another through thick and thin, living pretty much drama free (thank goodness!! ), and inspiring one another with challenges that have made us each reach our personal goals. Thank you all for the time we've spent together in this fun group. For this card, I used a beautiful paper from the GCD Studios' Kathy Davis Scatter Joy line called "Journeys." 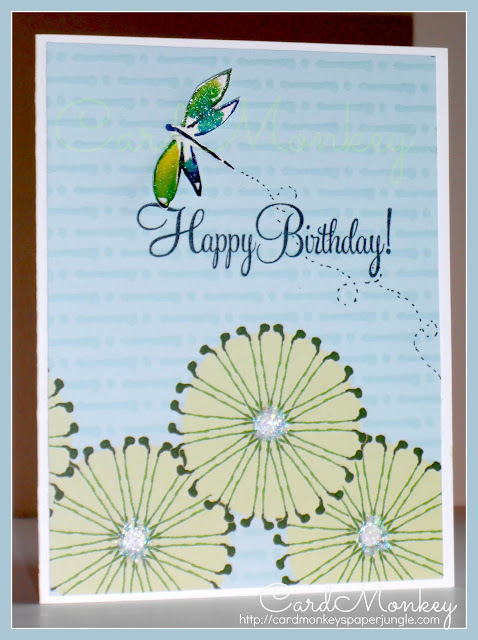 I stamped the cardstock with a sentiment from Close To My Heart called "Card Chatter - Birthday". The dragonfly was fussy-cut from another of Kathy Davis' papers in the same collection (shown at right). These papers are distributed exclusively at Joann Stores nationwide and online. I drew the dragonfly's flight path, and dabbled the centers of the flowers using CTMH's Stardust GLITZ. So why does this single, simple card "represent" where I am in my crafting life today? It incorporates many of the new paths I'm exploring ... with Close To My Heart as a business and lifestyle; with Joann Stores, teaching crafters of all ages. And today, I will be having coffee with Bill Lessa of Kathy Davis Studios to see how I may be involved in teaching at their studio and possibly volunteering with them, to follow their dream to develop a community art center! Life is so good. Enjoy the journey. Follow along on the hop, below, to please wish my fellow members of the KCC a very happy birthday! who is the newest member of the KCC! Lissa Marie So many crafts, so little time! Fun card! You sure are doing a lot right now.. For me crafting is almost back burner..
Oh Pam loves her crafts, she just needs to get well to get back into the groove :) I love your card, very cool. I am so happy for your new beginnings and I hope you get all you want out of it! Thank you Ellen, my original longest dearest KCC member before we were KCC, I just could hug you but my arms won't reach from Washington State clear to the West Coast! But if I am ever in you area I will be expecting some of that Chinese take out you had tonight! You were killin' me! GORGEOUS card! Congrats on being an original member! Good luck and best wishes with all of your new "beginnings". I am thrilled to be a part of such a wonderful group! Looking forward to getting to know each of you better! Thanks for sharing this hop. I'm enjoying it. Such a nice story. As you know, I am at the beginning of my blog hop journey with one under my belt and I can identify with all of the gitters. Hoping my story turns out just as well as yours! Thanks for the giveaway! I already follow you so I am off to complete the hop! Wonderful card . Thanks for sharing! Ellen - thanks for the warm welcome my friend!!! Your card is just darling!!! I love your work and so will your students at Joanns!!! So glad to be in these hops with you ladies!! Ellen what exciting things are happening for you! thanks for sharing with us. I love crafting with you on this Krazy Crew! Oh and the card is beautiful! beautiful card! sounds like life is good!